Adapted from Beyond the Plate, where it was inspired by Dorie Greenspan’s Chard Stuffing. Quantities of each ingredient are up to you, of course - adjust each according to your taste. 1In a medium pot of boiling salted water, cook the quinoa for 12-14 minutes, until just tender and the germ separates, making a little curly Q. Drain well in a fine sieve, then return to the pot (off the heat, but still warm), add the cranberries, cover with a tea towel and the lid, and set aside to cool. 2In a medium skillet set over medium-high heat, heat a drizzle of oil and sauté the shallot or onion for a couple minutes, until soft. Remove the tough ribs from the kale, stack the leaves and thinly slice them. Add to the pan and cook for about 5 minutes until wilted. If you like, add a small splash of water to the pan to create steam, and cover for a few minutes. Season with salt and add a pinch of chili flakes, if you like. If you added water, remove the lid and cook until the moisture has cooked off. 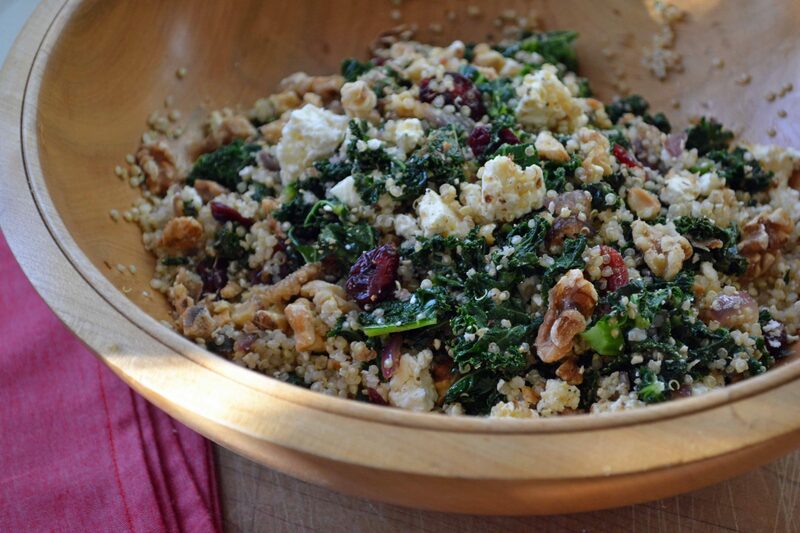 3Add the kale to the quinoa, along with the feta and pine nuts or walnuts. Drizzle with oil and season with salt and pepper. Add a squeeze of lemon, if you like. Toss again and serve immediately.